George Olson was considered by many to be the father of the Santa Cruz ULDB sailboats. In 1968, George Olson, then 29 and a longtime surfer, surfboard designer and sailor of the endless long swells of Monterey Bay, California decided to create the boat that would win the “proposed” under 30 foot Transpac. This was long before he became famous as the creator/co-creator of the Moore 24, Santa Cruz 27, Olson 25, 29, 30, 34, and 40. In fact, in 1968, George was employed in the rather humble occupation of ‘hod carrier’, the guy who carries bricks up a ladder for the mason. “I played around with boats as a hobby,” he says. To George’s way of thinking (and budget), the challenge was to create a boat with the same keel, displacement and sail area as a Cal 20, but longer and faster, with the most waterline possible. This was an extension of the thinking that created Sopwith Camel, a maxed-out, masthead ‘Cal 20-plus’ he’d built with Wayne Kocher. 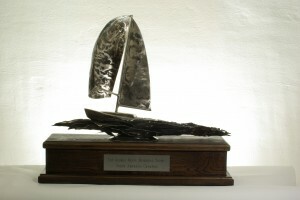 The previous year, they’d sailed it to victory in the MORA long distance race to Newport Beach. The result of all the number crunching was Grendel, a 24-ft fiberglass rocketship built of fiberglass over a male mold. Although the MORA TransPac never happened, Grendel (named for the monster in Beowulf) proved a terror on the water, winning the 1970 MORA season championship and that year’s MORA Long Distance, which finished in Ensenada. When Ron Moore rescued Grendel’s mold from certain destruction, a new partnership was born between Ron and John Moore and George Olson. The next chapter of the story was the creation of the Ultimate Wednesday Night Boat for Monterey Bay – Summertime. The first thing the trio decided was that new boat needed a little more beam than Grendel’s 5 feet and change. No problem. They just jammed a few 2X4s in the mold and pried it apart until it looked about right. A foot more beam looked pretty good, and the glass and resin started flowing. Wednesday nights would never be the same again. (Today, GRENDEL sits in a slip on “O”-dock, and with a casual glance, you cannot tell her dark green hull apart from a nearby Moore 24.) The partners were expecting a downwind hot rod, but to everyone’s surprise, the boat pointed well, too. Off the wind, the high, flaring bow kept the boat’s head above water while surfing and the V-bottom made it track so well that the faster it went, the easier it was to control. It wasn’t long before locals started pounding on the Moore brothers’ door saying, “I need to have one of those, too!” Summertime was the prototype of the popular Moore 24. George Olson’s finest design was the Olson 30, a boat he designed in 1978. On a delivery of Bill Lee’s MERLIN back from her record breaking ‘77 Transpac, Olson came up with the idea while sailing with Denis Bassano and Don Snyder, who lent their initials to the prototype’s name, the SOB 30. The resulting boat was christened PACIFIC HIGH, and was launched in 1978. As a result of PACIFIC HIGH winning many local Santa Cruz races, Olson constructed a semi-tweaked plug for a production boat. The draft was reduced, the freeboard increased, and the teak decks of the prototype were replaced with fiberglass and gel coat non-skid, and was renamed the Olson 30. Taken to the Long Beach Boat Show, Olson 30 #1 netted 15 firm orders and Pacific Yachts was now in business, a partnership between George, Lyn Neale and Alan Wirtanen. Pacific yachts built many hundreds of boats to Olson designs including George’s “Olson” line until 1987 when Pacific ceased operations. For 30 years Olson 30’s and Moore 24’s have been synonymous with the best downwind surfing ever. George Olson left the wild and crazy boat building business for a number of years. He went on to design and build amusement park sets for Disney and Universal, among others. 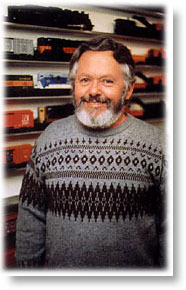 George Olson, iconic boat designer and builder, inventor, model train enthusiast, father, devoted husband to Lyn Neale, considered by many to be the father of the Santa Cruz ULDB’s, died of cancer in November of 2008 at age 69.